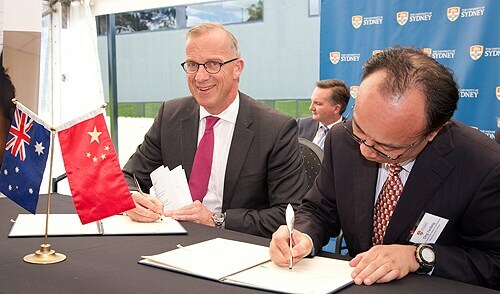 (L-R) University of Sydney Vice-Chancellor Dr Michael Spence and Nanjing Agricultural University's Professor Ding Yanfeng signing the memorandum of understanding. A new milestone in Australian and Chinese collaboration has been reached today with the signing of agreements between the University of Sydney and two premier Chinese research institutions to tackle the mutual challenge of food security. At today's launch of the University of Sydney's new Centre for Carbon, Water and Food, by Australian Prime Minister Julia Gillard, two memoranda of understanding were signed by representatives from the Chinese Academy of Agriculture Science and Nanjing Agricultural University, in the presence of the Ambassador of the People's Republic of China in Australia, His Excellency Yuming Chen. The Centre for Carbon, Water and Food is Australia's first multidisciplinary research centre dedicated to tackling the nation's and region's biggest food security and environmental challenges through the integrated study of carbon, food and water. The University of Sydney and the federal government have together invested more than $20 million in the purpose-built facility, which draws upon the University's already established world-class expertise in areas such as soil science, ecology and ecophysiology, and plant breeding. The first memorandum of understanding between the University of Sydney and the Chinese Academy of Agriculture Science will see a Sino-Australia Joint Laboratory for Sustainable Agro-Ecosystems established and housed at the Centre with a mirror facility in Beijing. The second memorandum of understanding between the University of Sydney and Nanjing Agricultural University will see a Sino-Australian Laboratory for Food Security established and housed at the Centre with a mirror facility in Nanjing. These new agreements will enable joint research in areas such as crop protection, food and soil security and the mitigation of climate-change effects on agricultural eco-systems, including the reduction of greenhouse gas emissions. The bilateral effort will include research projects for external agencies such as the World Bank and Gates Foundation, creating further international benefit from the collaboration. Professor Mark Adams, Dean of the Faculty of Agriculture and Environment and Head of the Centre for Carbon, Water and Food, said the longstanding relationship between University of Sydney researchers and China celebrates a new phase of development with the signing of the two agreements. "These agreements are the culmination of several decades of collaboration already undertaken between University of Sydney researchers and Chinese colleagues from a multitude of institutions," said Professor Adams. "Australia and China face many of the same challenges in food security. In China, for example, water yield and quality in major river systems and the land base for agriculture are threatened by both degradation and alternative uses, much like in Australia." "We both face the same problems with respect to water, soil, pests and disease." "By comparing research approaches and collaborating on research we are able to learn from each other and redouble our efforts to address these mutual areas of concern." food security - development of economic and social policy to secure food supply. treatment and recycling of poultry litter and livestock manure. Professor Adams said each partnership will deliver for both Australia and China over the coming decade and both Australia and China would use their partnership to help build further and stronger bridges with other institutions and countries. "We are excited about what is possible - we expect more than 100 PhD graduates to work with the Centre, to produce technologies that increase production while improving efficient resource usage, and to create new knowledge in key fields that underpin food security including research on water, greenhouse gases, biodiversity, and plant and animal breeding," Professor Adams said. "We will also produce better skilled and more broadly trained researchers able to work on more resilient food systems and higher quality and safer food."